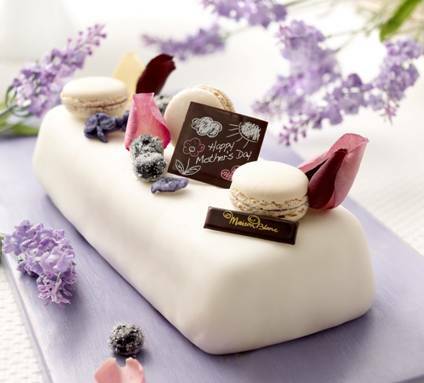 Just spotted this wonderful cake from Maison Blanc for Mother’s Day and gobsmacked at how pretty it was. For years I worked with M&S and their Mother’s Day cakes were always yellow and pink (and or blue) every year, same cakes looking exactly the same. This one is so pretty with the wee macaron on top and the colours of lilac and cream are soft and lovely. With Mothering Sunday arriving on 15th March, Maison Blanc has created a stunning and irresistibly indulgent blueberry and violet sponge cake, especially for the occasion. As your wonderful mum has created so many special memories for you over the years, Maison Blanc has carefully hand-crafted its Blueberry Oreiller to help you make this Mother’s Day a truly memorable one for her. A rich passion fruit sponge studded with blueberries and wrapped in pillow soft violet-scented regal icing, the Blueberry Oreiller is adorned with macaroons and crystallised blueberries and finished with edible violet and rose petals. It’s the perfect way to say ‘merci, maman’. The Blueberry Oreiller is £19.99 and serves 6. Maison Blanc also offers a wide selection of other hand-crafted patisserie that can be enjoyed in its shops or at home, as well as hot and cold breakfasts, lunches and light meals.